In addition to the three goals above, I also decided to go to battle against sugar. I started reading a book called The Case Against Sugar by Gary Taubes. The book, which describes the history of sugar in our culture, really helped to reinforce that I should be thinking more about the amount of sugar I consume. I grew up in the 80's when limiting fat was the goal. As a result, I thought I could eat an entire pack of Twizzlers because it was a low fat food. I feel like the 80's approach to a low-fat diet without much concern about sugar intake is flawed. To my surprise, I've done great with my new tactics to be healthier. I zoomed past my "31 Days of July" objective. I'm currently on day 43. 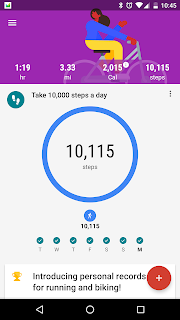 Notably, the most difficult of the three goals has been the 10,000 steps per day. On many nights I've had to start an evening walk as late as 11PM to reach the objective. Nevertheless, I've pushed through. What are my results? Well, I feel great, and I'm more confident about my physique. I've lost about 16 pounds since July 1st. This may seem strange, but I feel like I've matured my bitter taste buds in the process. Bitter foods and drinks are still bitter. However, I have a sensation of a sweet taste while drinking plain coffee and eating some vegetables. I'm sure I'll eventually miss one of my three goals for whatever reason, but I'm not done yet. I'd like lose another five to ten pounds to truly be in the ideal weight for my frame. Lose It - This is an app used to track food consumed. I've used food tracking apps before, and I failed because I tried to be extremely precise. Lose It has an extensive database, but if they don't have the exact food from the exact establishment, I don't stress about it. In doubt, I will increase the portion size in app to be more than what I actually ate. Google Fit / Android Wear Watch - Since before July, I've been wearing a Fossil Q Marshall Android Wear Watch to track my steps. 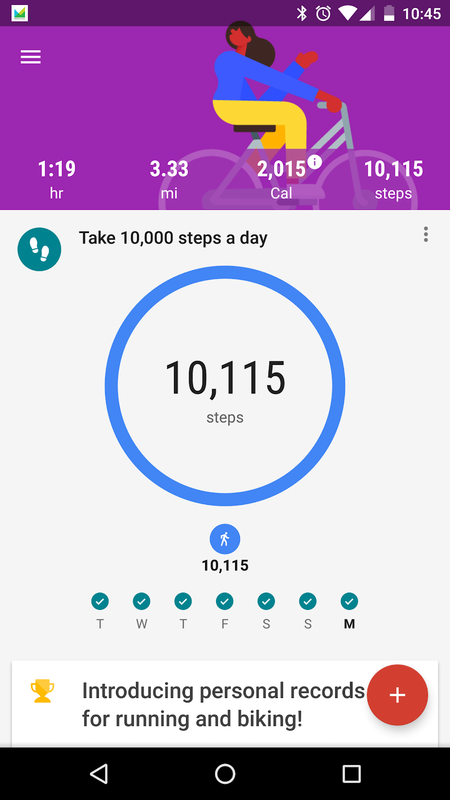 The step count flows into Google Fit which then flows into Lose It. This is how I got my net calories. Hydro Coach - I use this app to track my water intake. It's a basic app but allows me to create custom cup sizes to easily input common amounts. I didn't speak much about my water in-take, but I'm in a habit of drinking almost half of my 100 ounces within my first waking hour each morning. In addition to these tools, I've also added Olly vitamins to my morning routine. Olly seems to make a good product. I've enjoyed my Olly routine as they have a good taste. Olly vitamins do have sugar and probably account for the majority of the sugar I consume these days. I'm looking forward to seeing a few more months of results, but so far the routine I've described has been achievable. These routines are becoming habits. I'd like to close with a short story. Recently, I was at Starbucks and I almost ordered a vanilla iced coffee which has sugar and therefore calories. I was with my son and I decided to stick with a plain black coffee because hanging out with my kids and feeling more confident about my health is pretty sweet.